An unmanned SpaceX Dragon cargo ship delivers fresh NASA supplies to the International Space Station on April 17, 2015 in this still from a exterior station camera. It was SpaceX's sixth commercial cargo delivery for NASA. 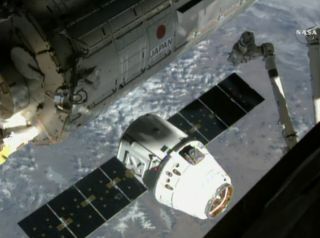 SpaceX's robotic Dragon cargo spacecraft has rendezvoused with the International Space Station to deliver vital supplies, bringing a three-day orbital chase to an end. Italian astronaut Samantha Cristoforetti grappled the Dragon capsule with the space station's huge robotic arm at 6:55 a.m. EDT (1055 GMT) Friday (April 17), securing the commercial capsule to the Earth-facing port of the Harmony module. Cristoforetti and the other five crewmembers aboard the orbiting lab will soon begin offloading the 4,300 lbs. (1,950 kilograms) of food, scientific experiments and other supplies that Dragon brought up from Earth. This gear includes the space station's first-ever space espresso machine, which is called ISSpresso. Also arriving aboard Dragon are numerous experiments that will help researchers study how the bodies of NASA astronaut Scott Kelly and Russian cosmonaut Mikhail Kornienko change over the course of their 12 months in space. Kelly and Kornienko, who reached the station late last month, are the first people ever to spend a year aboard the orbiting lab. (Crewmembers typically stay for five or six months.) The duo's extended mission is designed to help pave the way for missions to faraway destinations, such as Mars. Dragon launched atop SpaceX's Falcon 9 rocket from Cape Canaveral Air Force Station in Florida on Tuesday afternoon (April 14). After sending Dragon on its way, the rocket's first stage came back to Earth and attempted to land on SpaceX's "autonomous spaceport drone ship" in the middle of the Atlantic Ocean. The maneuver, a test of reusable-rocket technology, nearly worked: The booster stage succeeded in hitting the ship, but it toppled over and exploded. SpaceX holds a $1.6 billion NASA contract to fly at least 12 unmanned resupply missions to the space station using Dragon and the Falcon 9. The current mission is the sixth of these cargo runs. Dragon is scheduled to stay attached to the orbiting lab for five weeks, then come back down to Earth for a Pacific Ocean splashdown in late May.